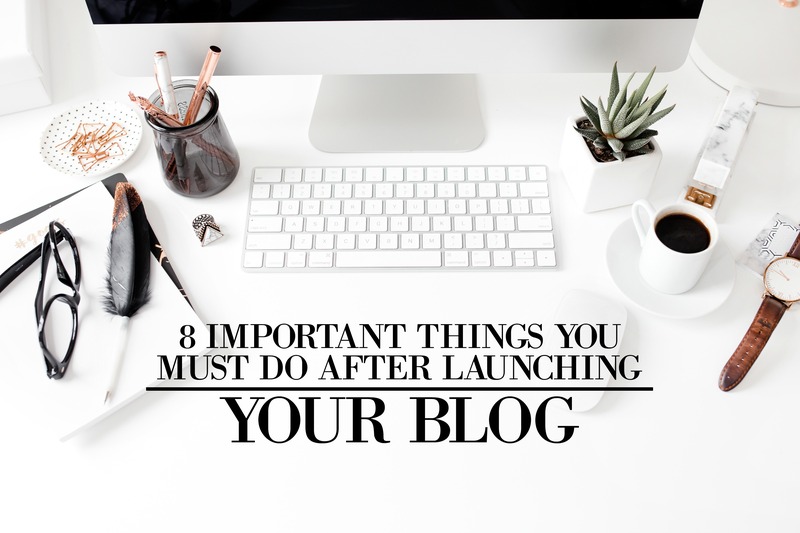 Alright, so you’ve launched your blog… now what? You’ve probably read my post on what you need to do after buying hosting, so you might be curious about what’s next. We get it! There’s a lot to do when you’re making sure that your blog is a success (financially and in other ways). And that’s why we’ve created a post just to help you continue on your blogging journey. It’s a lot of work, so you need all the help you can get. Many bloggers out there just tell you to buy hosting and start a blog, but they don’t give you steps to follow so you can really become a success. And that can be seriously frustrating (we’ve been there!). So down below, we’re giving you the tips and advice you need to make sure things go smoothly and efficiently for your blog’s journey! If you haven’t read my post on what you need to do right after buying hosting, you can check it out here! Alright, so in the last post, I mentioned about using BoardBooster; an automated pinning system (that’s SO easy to use), and how I use it. And now that you’ve got it set up and your blog is launched, it’s time to unpause those campaigns and let them run! Now you can watch daily as traffic rises from Pinterest. When you’re first starting out, it’s super helpful to find great communities on Facebook that’ll help you grow and answer questions when you have them. It can be a bit hard at first, but when you have people willing to help you, you’ll be less likely to give up on your blogging journey. It’s also a great way to network and extend your reach. And when you extend your reach, more people will know about you in the blogosphere and start to see you as an influencer. Here are two things to be cautious of though! 1. Make sure you don’t spend too much time on these groups. They can be potential time-wasters and help you procrastinate from actually creating content and growing your blog on Pinterest and other social media sites. 2. Not all Facebook groups are equal. Some may have 5,000 members, and while that sounds great, they might just be a ghost town. What I mean by this is that due to Facebook’s algorithm or the group owner not keeping up the community, hardly anybody will be interacting and posting on it. Often times, in groups like these, you’ll see a constant stream of people’s posts on the group page, with just a couple likes (or no likes at all), and no one commenting. It’s a dead zone. Almost every blogger I know talks about how they wish they had started their email list when they first began blogging… and I’m completely on that boat. It’s a mistake that many make just because the idea of creating an email list and keeping it up sounds complicated (or at least for that’s how it was for me). But it’s actually not! It’s pretty easy, even if you’re not tech savvy like me. But I’ll get into that in a moment. First, I’m going to talk about why it’s important. Those first subscribers are the most important when you’re starting out on your blog because they’ll be your biggest fans later on. They’ll be the ones to spread the word, interact on your site, and when you decide to sell/create a product one day, they’ll most likely buy from you (because they trust you!). Also if any social media site decides to hurt your reach, you’ll still have your email list. Now, how is setting up an email list super easy? Well it’s super easy because I’m going to tell you of a site that’ll offer you the best quality for email list building. They’re super intuitive and not complicated at all. Side Note: I seriously hate complicated technical products. My brain automatically shuts down when I have to deal with them. The email list builders that I love best (as of right now) is Convertkit. Convertkit (which you can watch a video here about how to set it up and use it) is probably the easiest one to use. Almost every blogger I know raves about it. Now Convertkit may not be free ($29 for your first 1k subs) but if you can find a way to afford it by cutting out a few things (ex. a couple Starbucks drinks a week), it’ll save you a world of hurt. The reason for this is because I’ve heard so many bloggers talk about how big of a pain it was to transfer all of their subscribers over from a free email list builder (like Mail Chimp) to a better one like Convertkit. It took them hours and sounded like a total nightmare. PS – Feel free to check out my post on how to start an email list! You can also check out Convertkit here! Make sure that keep your email list updated every week so they stay interested and continuously have you in their mind. Make sure that every week, you’re consistently creating content to put out on Pinterest. That way, you have a constant set of traffic streams coming into your site. Also, you can quickly see what topics are working for your blog, and what’s not. Now if you don’t have a ton for time to do 5-6 blog posts a week, that’s fine! Just let that number be something you shoot for. Now when your pins are first starting out on Pinterest, keep track of them. See what’s working and what’s not. If a certain style isn’t doing well, look around at other bigger blogger’s pins, and see what they’re doing. Create pins inspired by their style (or your own idea) and see how they do. Continuously make sure you’re changing when you see another style do better. Guest posts are a great way to spread your influence and reach. Also, it’s super important for networking, so that in the future, you can reach out to those same people (that you did a guest post for), and ask for help or collaborate on a project with them. Now if you’re nervous about reaching out to bigger bloggers, start with people who are just a bit bigger than you. It’ll help you gain courage, and you’ll be able to reference and link to those posts when contacting the bigger sites you want to guest post on. When I first started my mastermind group, I couldn’t believe how helpful it was. It helped grow my income immensely! I seriously suggest finding a group of bloggers that can help you to grow in your niche, promote each other’s content, as well as give outside perspective, give tips, hacks, references, resources, and advice you never would’ve thought of. Plus, you’ll make good friends for years to come! A great way to do this is to start searching through bigger bloggers income reports. People like Pat Flynn and Michelle from Making Sense of Cents, will openly list out the sources they use to create income every month. It’s a great way to see the high performing affiliates, ad networks, and products they’re selling. Then you can create a list of potential income drivers, which will up your pay throughout the months! Not there’s a ton to do when you’re first starting out as a blogger. It can seem a bit exhausting and intimidating, but it’s so rewarding when you start to see progress. And when you’re finally able to work from home (or anywhere like us! ), you’ll have so much more time freedom to spend with the people you love, and do the things you want to do. Now if you have any questions, just let me know in the comments down below! I’d love to help you out. Hi Silas and Grace! Thanks for posting this. I have been following you guys for awhile now and I love your blog! I think you’re right on the money when you say to reach out to bloggers who are just a little bit bigger than you to guest post. As a new-ish blogger, it’s intimidating to reach out to large bloggers. This is something I want to start doing! Really appreciate this post and your income reports! Am a newbies and I do not have money to promote website most especially my mail list not working, please help me check the website and say something about. Hi Silas & Grace! I LOVE your blog! I’m a new blogger and you are right! I literally don’t have enough hours in the day to do everything that needs to be done. Your type of content is what I’m going for with my own blog. I’m struggling right now with getting my images right…branding, I guess you can say. Just not sure if I’m on the right track. When I find my style, do you think it’s necessary to go back to all my previous post (23 as of now) and change them? If so, how do you move forward if you have to keep going back? Also, Pinterest is another monster that I’m trying to work, but there’s sooo much to know and learn. Will keep plugging along. Have come to far to give it now. Any feedback would be greatly appreciated! Thanks! I’m so glad to hear you’ve been working so hard on blogging! I think that if you find your theme, but don’t have much time, then go back and change it later. Or perhaps go back and change a few posts a day (2-5). Thanks a lot for your and selfless service. Hi Silas and Grace! Thanks for posting this. What’s a campaign? A campaign on BoardBooster is a feature where it allows you to copy and paste the URL links (from a secret board) into a box, then pick the personal and/or group boards you want it pinned to. It also allows you to set a time of day for them to pin.